Stephen Tweed's Private Duty Today wrote a fantastic article entitled Starting a Non-Medical Home Care Company in 10 Steps. It is a comprehensive and insightful look at what to consider, and some Best Practices to implement when starting up a private home care business. The full article provides a number of useful links and resources that you can use to determine if this type of business is for you, what pittfalls to look out for, and detailed informational content to help you along each of the 10 steps. If you're interested in a demo of Ankota's non-medical home care scheduling, billing, and coordinating software, just click here to schedule a demo. If you are interested in learning about Best Practices in home care, you can download our 7 Habits of Highly Effective Home Care Agencies. 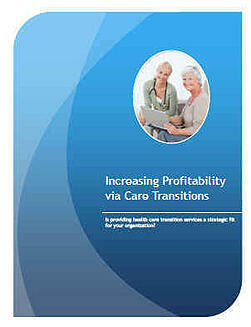 You can also check out an informative video and download our free white paper, Increasing Profitability via Care Transitions by clicking the link or the picture below. Ankota provides software to improve the delivery of care outside the hospital, focusing on efficiency and care coordination. Ankota's primary focus is on Care Transitions for Reeadmisison avoidance and on management of Private Duty non-medical home care. To learn more, please visit www.ankota.com or contact Ankota.